The data-dependent Federal Reserve isn’t likely to contest the evidence: The economy looks strong enough to withstand another interest-rate increase. It will take a couple of months for U.S. central bankers to figure out the economic policies of President-elect Donald Trump. What they know now is that stock markets are hitting record highs, market-expectations of inflation are moving up and consumer sentiment has improved since the election — all of it signaling the time is right to raise the benchmark lending rate. Fed officials earlier this month saw a strengthening case to raise rates as the labor market tightened, with some saying a hike should happen in December, according to minutes of their Nov. 1-2 gathering released Wednesday in Washington. They made no direct reference to the national election a week later that would unexpectedly propel Trump to the White House. “Some participants noted that recent committee communications were consistent with an increase in the target range for the federal funds rate in the near term or argued that to preserve credibility, such an increase should occur at the next meeting,” the record of the Federal Open Market Committee meeting showed. Many officials said a rate rise could be appropriate “relatively soon,” data permitting, it said. Fed officials will hold their final meeting of the year on Dec. 13-14. While it is still difficult to tell what policies Trump will put in place, market indicators are defaulting to a forecast of faster growth and higher inflation. That’s boosted expectations of a rate increase next month. Investors see a 100 percent probability of a move, according to pricing in federal funds futures contracts. The November minutes also showed officials emphasized that near-term changes in the benchmark borrowing cost would be dependent on economic data, with the expectation that “only gradual increases” would be warranted. FOMC members noted that labor market conditions had improved “appreciably.” The minutes showed diverse views on the amount of labor-market slack and the risks surrounding their 2 percent inflation goal. “It was noted that allowing the unemployment rate to modestly undershoot its longer-run normal level could foster the return of inflation to the FOMC’s 2 percent objective over the medium term,” according to the minutes. Since officials met the week before the Nov. 8 presidential election, they’ve seen strength in domestic consumption with retail sales in September and October showing the biggest back-to-back gains since 2014. Stock market increases have boosted household wealth. 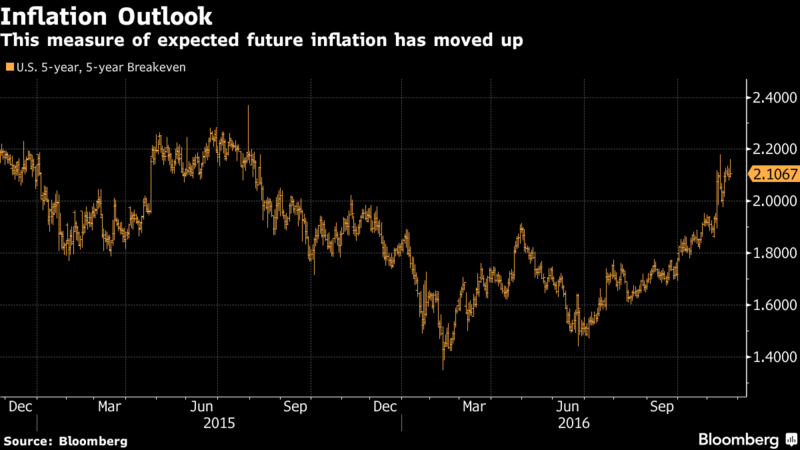 A market measure of annual inflation starting five years from now jumped to 2.1 percent Wednesday from 1.9 percent on Election Day. U.S. central bankers have held the federal funds rate target range at 0.25 percent to 0.5 percent since December. Two officials dissented earlier this month in favor of higher rates. Unemployment last month stood at 4.9 percent, only slightly above Fed officials’ median estimate of full employment. Core inflation measures are just below the Fed’s 2 percent target. The personal consumption expenditures price index, minus food and energy, rose 1.7 percent in the 12 months through September. At the same time, rates on a 30-year mortgage have jumped to 4.03 percent versus 3.54 percent at the start of the month, and the dollar is 4.3 percent stronger against major currencies, according to the Bloomberg Dollar Spot Index, possibly making U.S. exports less competitive. At the November meeting, Fed officials discussed the longer-term operating framework for monetary policy, concluding that the matter warranted further discussion, the minutes showed. The minutes noted that Yellen said the Fed would “proceed cautiously” and communicate in advance any changes to its operations.